Writing > Top Ten "Zacks"
Born in 1922 in Baku, Azerbaijan, this author of numerous books promotes an explanation for human origins involving ancient alien astronauts. Raised in Palestine, Sitchin learned both modern and ancient Hebrew as a child, and today fluently speaks several languages. While still quite young, he studied the Torah, and the history and archeology of the Near East. He later graduated from the London School of Economics, with a degree in economic history. According to Sitchin's interpretation of Sumerian cosmology, there is an undiscovered planet called Nibiru, which follows a long, elliptical orbit, reaching the inner solar system roughly every 3,600 years. Sitchin believes that Nibiru collided catastrophically with Tiamat, a planet located between Mars and Jupiter, and that this collision formed the planet Earth, the asteroid belt, and the comets. He asserts that Nibiru was the home of a technologically advanced, human-like extraterrestrial race. Sitchin posits that these aliens are the Anunnaki of Sumerian myth, and the god-like Nephilim referenced in Genesis. They first arrived on Earth roughly 450,000 years ago, looking for minerals, especially gold, which they found and mined in Africa. Sitchin believes they genetically engineered Homo sapiens as slave creatures to work their gold mines by crossing extraterrestrial genes with those of Homo erectus. 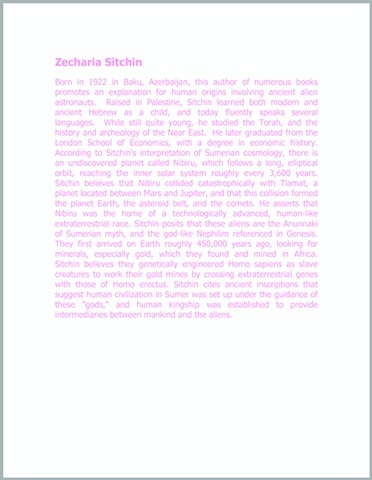 Sitchin cites ancient inscriptions that suggest human civilization in Sumer was set up under the guidance of these "gods," and human kingship was established to provide intermediaries between mankind and the aliens.